The histogram is available from Obscura’s control wheel alongside its other tools. Tapping on the histogram icon on the control wheel provides options to turn it on and off. Once enabled, a histogram animates from the bottom of the screen showing you the range of pixels exposed by the camera, which can help you tell if the shot you’re taking is over or underexposed. From the histogram behind Obscura's controls, you can see that the first image is underexposed and the last one is overexposed. 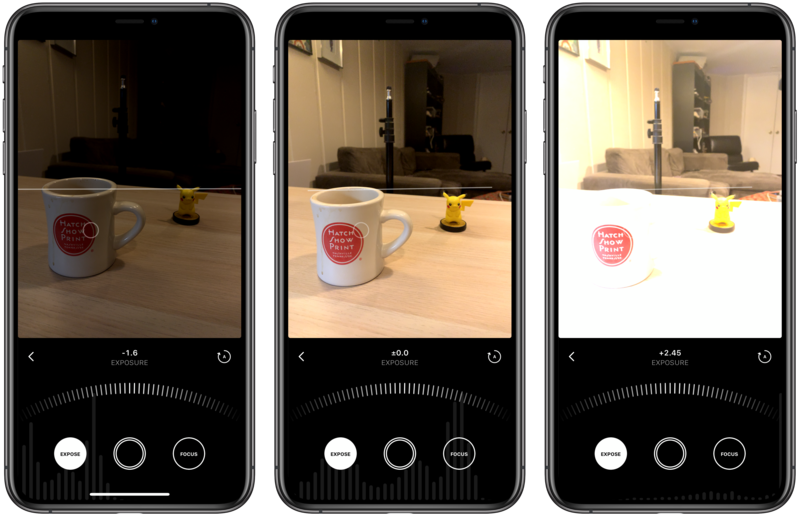 The histogram animates in real time as you move your iPhone or iPad’s camera around and adjust things like exposure, which makes dialing in a good shot easier. My one concern with this feature is that the histogram uses dark gray bars on the black chrome surrounding the app’s controls, which may be difficult to read in certain lighting conditions like on a sunny day, though I haven’t been able to test it in sunlight thanks to Chicago’s perpetually gloomy winter weather. Still, I’m glad the histogram feature has been added because it’s a nice visual confirmation of the exposure of a photo. The other significant update to Obscura is to the image viewer, which is a substantial improvement to the existing viewer. 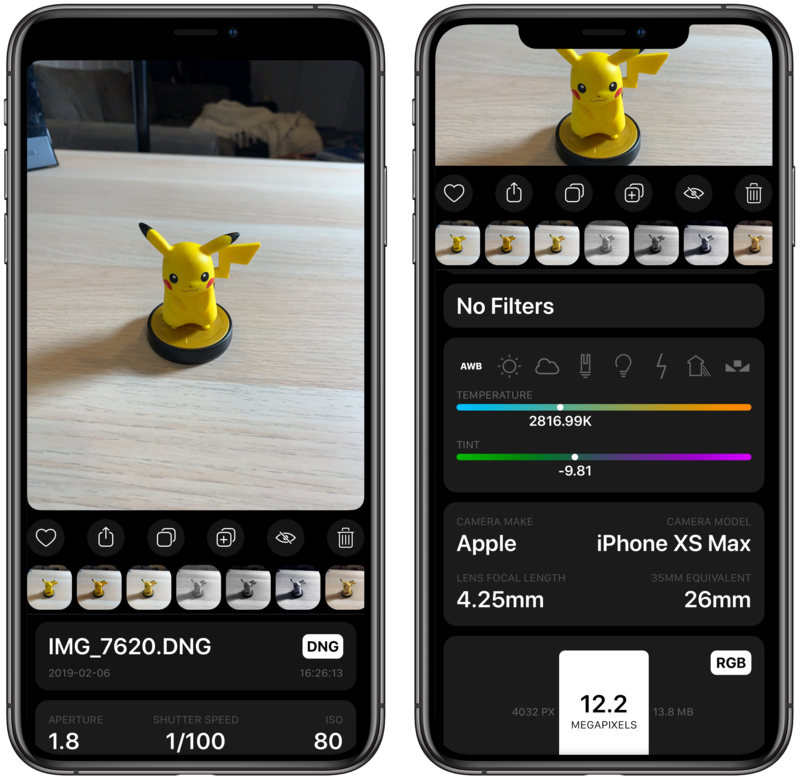 The information is better organized into card-like clusters of related information, uses color to convey temperature and tint information visually, includes filter data for images shot with Obscura, and on an iPhone, seems to use less vertical space than before. The design of Obscura's image viewer has been improved significantly. The interaction on the iPhone has changed from a single scrollable view to a scrollable view that pushes the image up the screen but not offscreen. That serves as a point of reference reminding you of the image you are viewing but means that only the portion of the view under the image is scrollable and there is less room overall for the metadata. The new image viewer has also migrated all image actions – marking an image as a favorite, sharing, copying, duplicating, hiding, and deleting – to buttons directly beneath the image, which is a substantial improvement aesthetically as well as functionally. 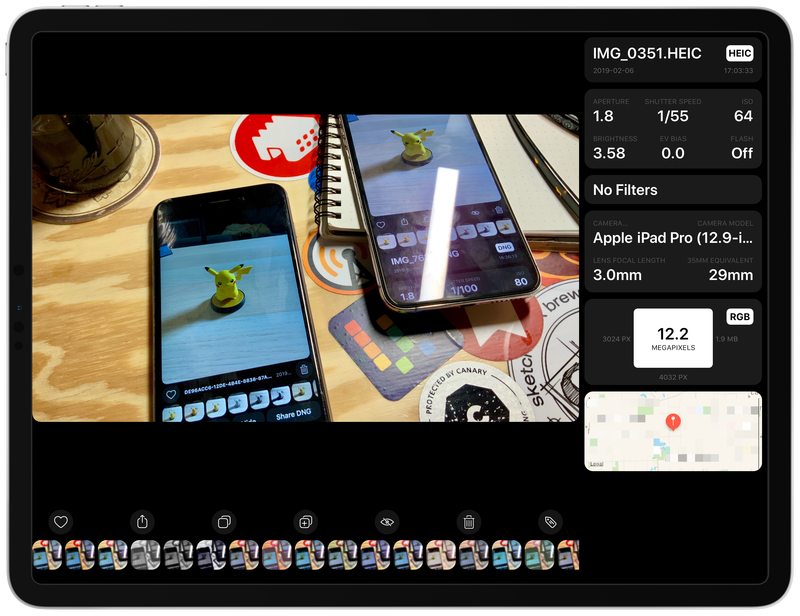 On the iPad, Obscura adds keyboard shortcuts for navigating between the app’s library and camera views, taking a photo, navigating among images in the library view, and performing most of the actions on individual images like applying a filter and sharing them. I don’t shoot photos on my iPad very often, but it’s my favorite device for viewing and editing photos, so the addition of keyboard controls for functionality like navigating my library, adding filters, and sharing them is a welcome addition. Obscura makes the most of the screen space on the iPad by moving metadata to a side panel. The image viewer works differently on the iPad. Instead of a scrollable view under the image, the metadata sits in a panel to the right of a photo and can be hidden by tapping the tag icon below it. The design makes good use of the iPad’s extra space, but the image viewer has a few bugs that need to be addressed to make it something I’d use regularly. The metadata panel doesn’t always appear when I open an image. Most often this seems to be the case with pictures taken with other camera apps and screenshots, though not always. Nor does the filter thumbnail beneath an image or the metadata panel consistently update as I swipe horizontally between images. I noticed this issue on the iPhone too, though not nearly as frequently. The RAW, JPG, and Live Photo badges found on thumbnails in the library on the iPhone are missing from the iPad too. The cumulative effect of these bugs makes for a rougher experience on the iPad than I’d like, which is too bad because it detracts from what is otherwise a much-improved design. 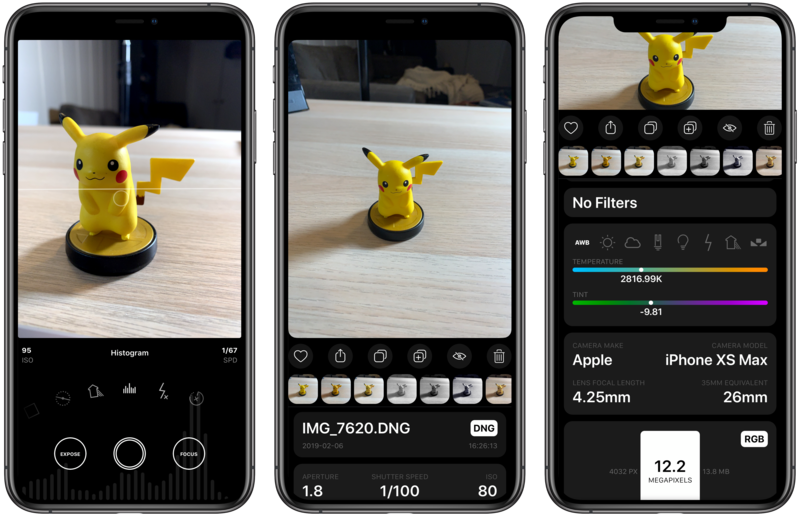 If you use Obscura on the iPhone, this is a solid update. The histogram improves the experience of taking photos, and the new image viewer makes quickly scanning the data about images easier. I don’t use Obscura often on my iPad, and the bugs in this update won’t change that, but I’ll revisit the iPad version when the bugs are cleared up because I like the new design and keyboard shortcuts. Obscura 2 is available on the App Store for $4.99. Additional filters are available as In-App Purchases.